Accumulation of energy in atmospheric vortexes. Vortex flows (e.g. 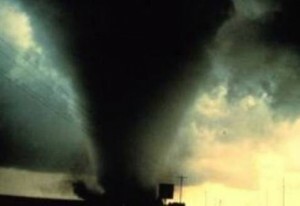 tornados) accumulate much kinetic energy from the Earth’s atmosphere. Presumably, the source of this energy is the thermal energy of air streams, which are sucked into the central zone of the vortex. Tornado generates a powerful sound. Rotation generates a pressure gradient. In these circumstances the Pressure Gradient Elastic Waves should arise. PGEW transfer energy from the center to the periphery of the vortex. The rotation and pressure-gradient are decreased on the outer boundary of a vortex. Pressure Gradient Elastic Waves dissipate and the energy of the PGEW is transformed into the kinetic energy of rotating air streams. The temperature rise phenomenon inside the solar “atmosphere” with increasing distance from the sun center. 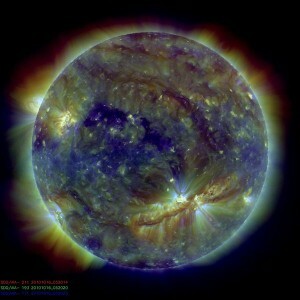 The temperature in the central zone of the sun is extremely high. With distance from the central zone, the temperature decreases. Inside the photosphere (the bottom layer of the Sun atmosphere) the temperature is found to be about ~ 5800 K. Yet, when the distance from the sun’s center is greater, the temperature increases. In chromospheres (the next layer of the Sun atmosphere) the temperature increases with height and ranges from 4400 K to 25000 K at the top. It is widely accepted that are intensive streams of solar plasma, powerful magnetic fields, and powerful sound waves, in the solar atmosphere. Perhaps Pressure Gradient Elastic Waves transfer heat to the upper solar layers. The solar “sound” could create PGEW. Streams of ionized plasma interact with Sun magnetic fields. The Lorenz forces might be directed upwards from the center. When the upward component value exceeds the force of gravity, a part of the solar atmosphere may be modified and the pressure inversely increases (bottom-up). Thus, there may be a PGEW heat transfer to the periphery of the solar atmosphere.